Sunday 10th June, early start for the final group matches in the Masters section. A really tough match against the unforgiving Israeli player Yakov Shaashua who beat me comfortably 3-1 to take second spot in the round robin stage. I finished in 3rd place which gives me a tough the draw in the last 32 being played tomorrow. Unfortunately only four players went through to to group, and it was Marc Choullier from France and local player Vilnus Mainulis from Latvia who failed to make the knockouts. I came to daugavpils because of my gf, It was a PLEASANT SUPRISE TO FInd this tournament. 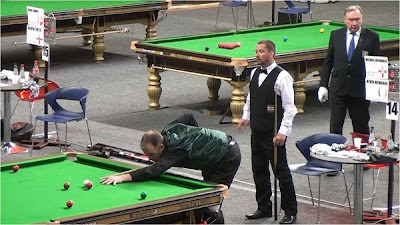 Although personally I am a noob pool player as oposed to a snooker player. Whats with all the oversized one piece cue cases?